Presented to Magnus Klintheim, also pictured with his ghillie Jim Smail, Jason Sweeney the sculptor and Tim Pilcher who presented the prizes. The season opened on Friday 1st Feb with high water and colour. Whilst it had dropped from Thursdays high, and a few hardy souls took to the waters above Kelso, nothing was caught but a couple of kelt salmon and sea trout as far as we know. Saturday dawned with the water dropping further and the sunshine, along with an easing wind and clearing water gave great excitement. However it was again that man from Sweden, Magnus Klintheim who landed the first fish from Lower Floors.The sun had began to warm, and the wind dropped. Amazingly, Magnus had in his very first cast hooked and landed a spring fish of about 7 pounds. This year’s first fish of the season on Tweed again! 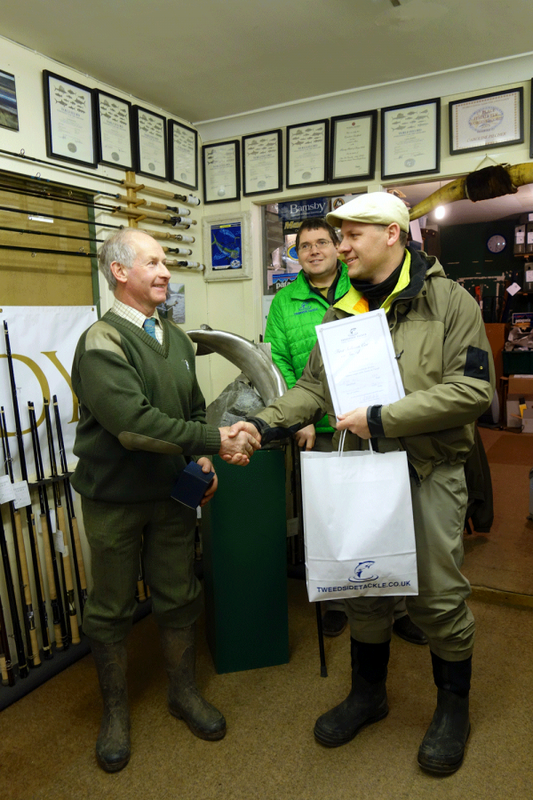 At Tweedside Tackle he was again presented with the magnificent trophy for landing the first fish and we hope he comes back to try for a third year running next year. Lucky man and lucky group as a further two fish were landed and eight kelts. Well done to the Lower Floors team for getting their anglers into fish on the opening day again. Have a look at our facebook page for the photos and our congratulations to Magnus for his trophy win and to him and Mathias on their day. Congratulations also to Jim Smail, shown with Magnus and Tim Pilcher of Tweedside Tackle.